Celia and her two sisters share more than a birth date--they each possess supernatural powers that allow them to know people better. But while her sisters are blessed with the gifts of seeing people's presents and futures, Celia can only see their pasts. This seems useless, until she meets the mermaid Lo. Lo is struggling to hold on to her humanity, and accessing forgotten memories helps her hold on. But their friendship is challenged when the girls clash over Jude, a drowning boy they helped save, and the dark forces behind what transformed Lo from human to mermaid are revealed. 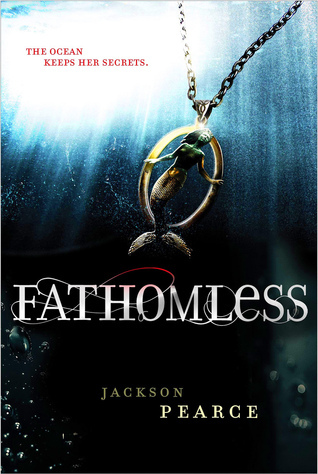 Jackson Pearce's Fathomless takes its inspiration from "The Little Mermaid" but it bears little resemblance to the original tale. The narrative is split pretty much equally between Celia and Lo, though Lo has a lot of internal conflicts that make her an unstable narrator, and Celia comes off as the more reliable narrator. Celia, her sisters, their powers, and their sometimes rocky relationship was interesting, but not really fully developed. Celia's new relationship with musician Jude is much more entertaining. Jude is the ideal male lead—kind, quirky, straightforward, with just enough romance. It's no wonder that Lo can't help but like him, despite her ulterior motives for wanting him to fall in love with her. Lo's struggles were heartrending, and her connection to Pearce's Sweetly will make readers happy, but there was still a maddening lack of information about her and her situation by the end of the novel. Fathomless moves quickly, and is a nice addition to Pearce's collection of supernatural fairy tale retellings, but it wasn't very satisfying. Cover Comments: It's pretty, but I am disappointed. Click here to find out why. I'm sorry that you didn't love this one!! It looks really interesting, and I actually like the cover. I haven't read anything by Jackson Pearce yet, but I will definitely have to pick up Sweetly, since there's a reference to it in this book! I have not read any mermaid books. I guess I'm waiting for THE ONE that I can't pass up.